Today I am thankful for a clean house. Yesterday I needed to work for several hours, and I left the girls with these instructions: Clean the house like I would clean it if I were here. I think you know what I mean, the level of cleaning that our house needed was more than just picking up, it was the works. I am happy to say that they did a great job! 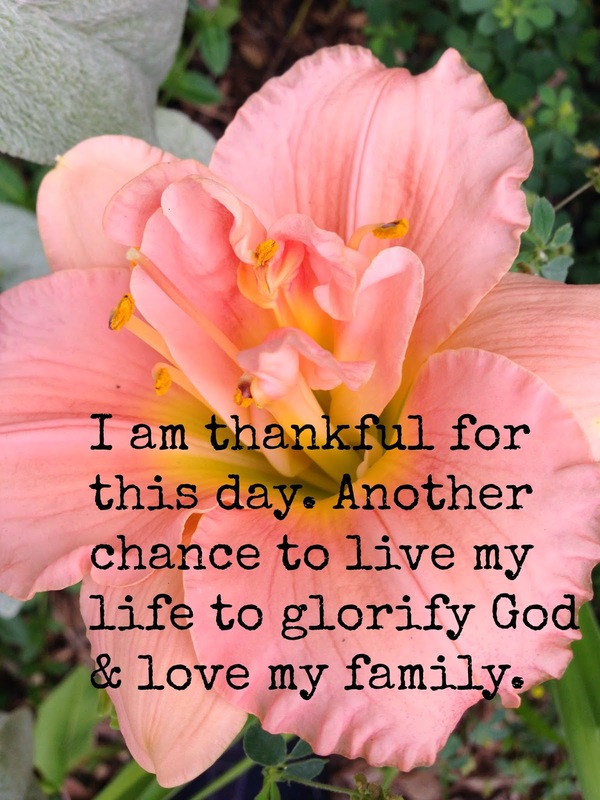 So today, I am thankful for our clean house! Now I might have time to clean off my desk. Stay tuned to find out if I actually get that done. Every once in a while, an opportunity comes along with the Schoolhouse Review Crew that you know you should take, because while it may not ever be your absolute favorite, it is from a solid company. 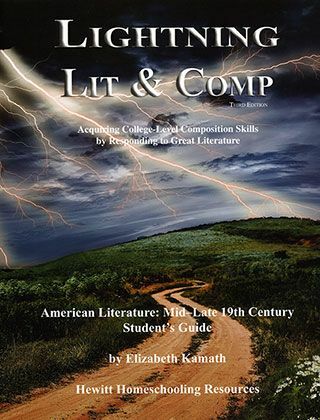 That was the case with our review of Hewitt Homeschooling's Lightning Literature and Composition, American Mid-Late 19th Century Student's Guide and Teacher's Guide. Arlene will be in 9th grade this Fall, and I wanted her to get some experience with answering comprehension questions, not just telling me orally about what she had read. Each year I have tried to offer Arlene a new way of approaching Literature so that hopefully she will be well-read and able to converse on a variety of classic books and topics as she gets older. A while back, Emily and I reviewed another Lightning Lit course, so I knew what to expect from both the Student and Teacher Guides. The Student Guides always begin with an Introduction, the one in Arlene's book is 24 pages. It covers A LOT of topics, including how and why to read and write, how reading poetry is different than prose, basics on writing a paper, and how to use the Guide to get the most out of it. This American Literature course covers several well known authors, including Harriet Beecher Stowe (Uncle Tom's Cabin,) Mark Twain (Adventures of Huckleberry Finn,) and Jack London (The Call of the Wild.) It also covers several poets including Walt Whitman and Emily Dickinson. The text of the poems and short story covered in the course are included in the Student Guide, you'll need to procure your own copies of the novels. Hewitt Homeschool has them all available for purchase separately, or you can borrow them from your local library. The Student Guide retails for $29.95, while the Teacher's Guide retails for $2.95. The Student Guide is an 160+ page 8&1/2 x 11" paperback, while the Teacher's Guide is 44 pages 3-hole punched (stapled together) that includes the answers to the comprehension questions and teaching and grading aids. For each of the novels in the course, the Student's Guide has an introduction to the book and author, comprehension questions for each group of 5 chapters, a Literary Lesson (Theme, Humor, Figurative Language, etc.) 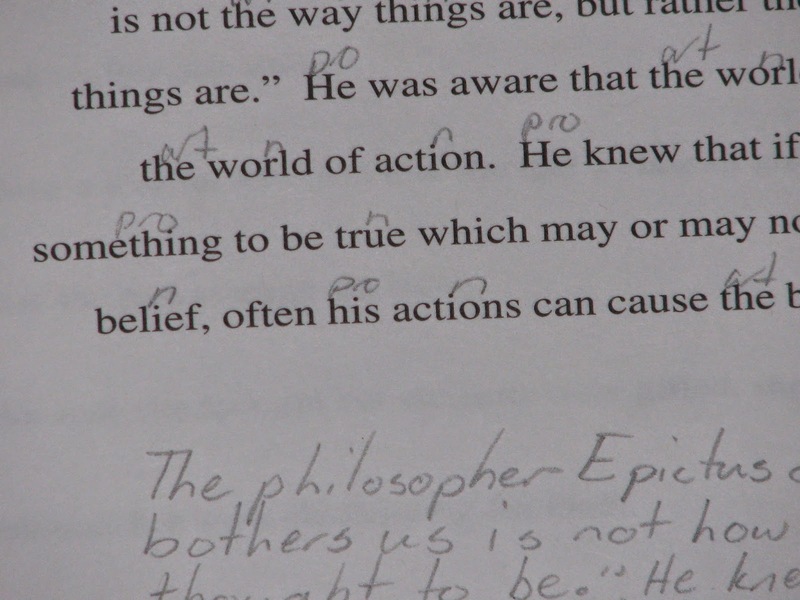 and then Writing Exercises related to the novel you just finished (or comparing it to a previous novel in the course.) The poetry and short story units are similar, although with a lot less comprehension questions. Overall, Lightening Literature's courses provide a solid framework for your student to work through a semester of Literature for High School. There is also included a year-long schedule in each book. Because we plan on doing some grammar with Arlene this next school year as well, Arlene will probably continue on using the year-long schedule. I think Arlene appreciates the variety of short-answer and multiple choice comprehension questions. I should have told her to write her answers in another notebook, but she managed to fit them into the small spaces on the pages. Maybe not the wisest choice, but there's still time for her to switch to a notebook for the other titles after Uncle Tom's Cabin. One thing I have always liked about Lightning Literature's courses - they are independent study style. Of course I discuss with Arlene what she read, but for the most part, she can just grab her book and her guide and go do most of it on her own. For a Mom who is always time-crunched between homeschooling, working, and our family's volunteering schedule - this is a real plus! One thing I want to mention is that Hewitt Homeschooling's Lightning Literature courses are worldview neutral. 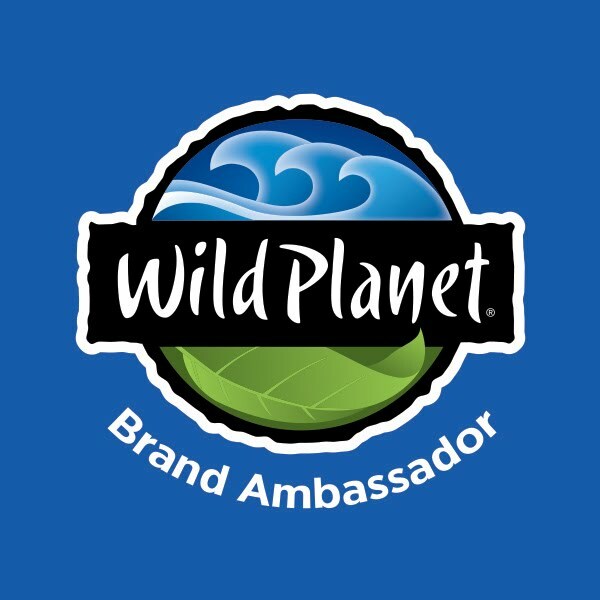 I can understand them wanting to make their products available to a wide market, but I also want you to understand that if you are wanting to discuss the reading selections from a Christian Worldview, you are going to need to add that in yourself. This particular title is geared for 9th grade and above. Although this is recommended for grades 9-12, because of the topics covered in Uncle Tom's Cabin and Adventures of Huckleberry Finn, I would NOT recommend it for anyone younger than 14. (I know sometimes students have skipped a grade or started school at an early age, so I just want to point out the maturity level I think is needed.) Hewitt Homeschooling has titles available from first grade through 12th grade, so if this one doesn't fit your student's range, be sure to click the banner below and read the Crew Reviews of several of their other titles. If you’re wondering whether or not it is important to teach your child grammar, I’ll answer you with one word - YES! How you teach grammar can vary widely, but I think we all want to spend our time wisely. I detested the thought of spending time every year teaching our girls grammar, so I was always on the lookout for something that could help them learn grammar and retain it for future use. When they were little it was easy, just pop in the Grammar Rock DVD and watch it. As they got older, that wasn’t enough and we tried a couple different programs. Now Emily is half-way through High School and I realized there were things she really needed to brush up on before taking those standardized tests hoping for scholarships. I also wanted her to have a quality refresher course before writing all of those scholarship essays. Whether or not your child is planning on pursuing a college degree, I think you should take a good look at Analytical Grammar. 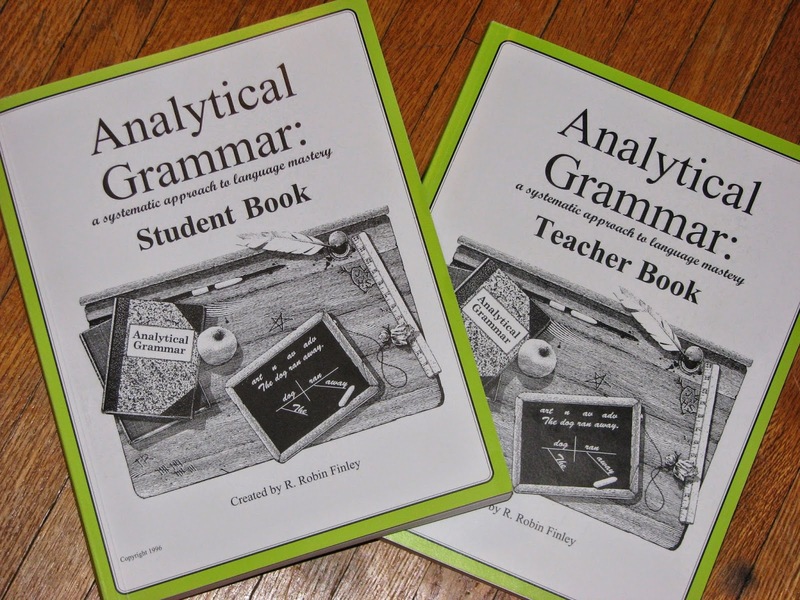 Emily and I have been blessed to review their flagship product the Set of Analytical Grammar, which includes both a Teacher’s Book and a Student Book. Trust me, you’re going to want the Teacher’s Book! Robin Finley created Analytical Grammar and tested it out in her classroom for twelve years making adjustments along the way before its first publication. I will say this is a thorough, solid, step-by-step approach to grammar. I’ll be honest, I had grammar in 6th grade. The only times I’ve diagrammed a sentence since then were while translating English to German in High School, and more recently English-Latin and back again. That does not mean it isn’t important to learn to diagram a sentence, it just means I don’t usually need to when proofreading. Grammar is more than diagramming sentences, as you’ll learn inside the pages of Analytical Grammar (AG.) This book is designed up to be used over three school years, but not for all year long, just part of each year. You could begin using AG in 6th grade and use it 6th, 7th, & 8th…or anytime after that. To keep your student’s skills sharp, AG offers four different review and reinforcement books ($19.95 each) to work on once every two weeks during High School. If your student doesn’t begin AG until their Junior or Senior year of High School, you can skip the extra books and just focus on the AG Student Book. The Set of Analytical Grammar costs $94.95. If you are going to use it with more than one student you must purchase additional Student Workbooks at $49.95 each. While I know some people may think the Set cost of $94.95 pricey, you will really appreciate all that you get in the Teacher’s Book and be thankful you spent the money. Not everything in grammar is easy . . . when is the last time you picked out a gerund? Like I mentioned earlier, it’s been a long time since I did much sentence diagramming, so it’s wonderful to have Mrs. Finley’s step-by-step instructions with me when explaining it to Emily. Notice the bottom line? It's from the Teacher's Manual! So unless you want to do every marking and diagramming exercise yourself - buy it! One point I liked a lot about AG is that in the beginning it starts, well, at the beginning. Some grammar programs I have seen throw too much at the student in the first week and expect them to absorb it all. In the Teacher’s Book, Mrs. Finley shares suggestions for grading your student’s assignments that include just focusing on what they got correct, and ignoring what they missed, or mis-marked. Beginning with Nouns, Articles, and Adjectives, Season One (year one) includes 10 units and ends with Conjunctions and Compound Situations. As each lesson proceeds, it reviews what the student has already learned and adds something new. Thus, you’re always marking the nouns, but you’re not marking verbs until Unit 4. Make sense? Seasons Two and Three go deeper into Grammar and include topics like participial phrases, adverb clauses, and transitive/intransitive verbs. A unique feature (probably born from Mrs. Finley’s years in the classroom) is the teaching of overcoming common errors. 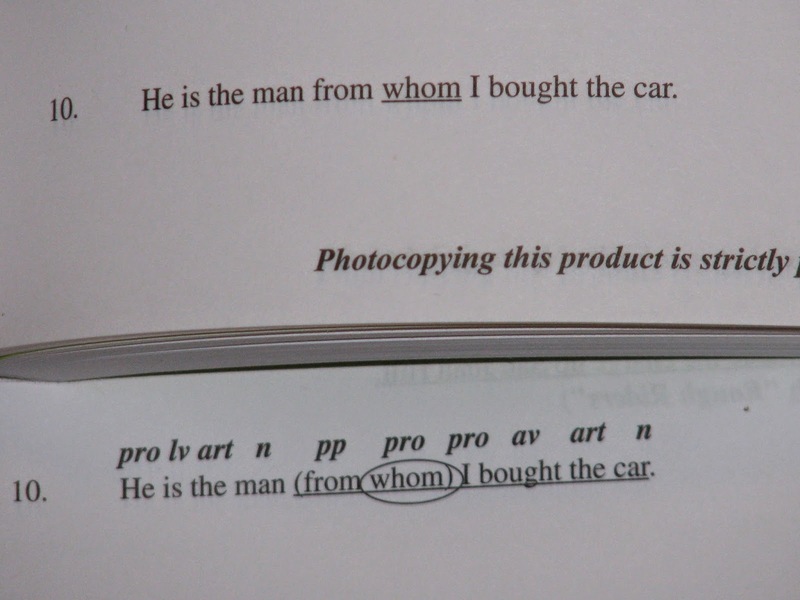 How many times have you stopped and wondered “Who” or “Whom?” If you don’t think this is necessary to learn, may I point out to you that Weird Al Yankovic just released a hilarious parody about “Word Crimes” and he pointed out this error. While I know Weird Al is probably not your definitive source on what is socially appropriate grammar, if he is pointing it out, I will guess employers are noticing it at job interviews too! So how does AG work exactly? You (the teacher/ parent) introduces each concept (reading the instructions) then you work on the first example or two WITH your student. Then the student does a page of exercises by themselves (referring back to the instructions, which are also in their book, as necessary.) Then you grade their exercises. If you see anything they are really struggling with you can talk about it right then. Tomorrow your student will have another page of exercises on the same topic. The third day your student will have a third page of exercises, then there is a Skills Support page. This Skill Support continues for the first ten Units (year one.) Then comes the test. It can be an open note test. Mrs. Finney also gives suggestions about having your older students ‘test out’ of an unit if you think they might not need to review/ learn the topic covered. If they score an 80% or higher, feel free to move on. This is the Skill Support page from Unit 2, notice how Emily marked the nouns, pronouns, and articles? (You can't see the adjectives in this shot.) Then she paraphrased the passage. I'm not worried that she missed a couple words she should have marked, as she worked through each unit, she got better at recognizing and marking her parts of speech. While normally I would have had Emily try to test out of the beginning units, I wanted to see how the 5 day cycle suggested in the book worked, so she did every exercise. This is not an independent study course. I guess you could try to use it that way, but I really think your student will do better spending the time with you as the teacher, than trying to learn it themselves! Please don't make them learn Grammar by themselves - how boring and frustrating that would be. Don’t worry - the Teacher’s Book is excellent, and you’re really only talking about 20 minutes a day. Think about that, 20 minutes a day, for parts of 3 years. You know your child is worth that investment! While studying grammar is rarely thrilling, these books are a lot less painful than those blue grammar books we used when I was growing up. I encourage you to check out Analytical Grammar’s website, and read through the “How it Works” and “FAQ” pages for more on the technical side of AG. For us, Analytical Grammar has been a painless way to make sure Emily has a solid footing for the rest of her writing years! Feel free to stop by AG's Facebook page, or visit in person with Robin Finley and her daughter Erin Karl at your local homeschool convention. I had the chance to sit down and talk about Analytical Grammar with them this past April at our convention - they're a hoot! There are several things I'm thankful for about the Symphony on the Prairie (SOP.) First- it's outdoors, in a lovely setting. The Symphony platform is near the base of a natural amphitheater on Conner Prairie's grounds. Next, SOP is a come as you are event, no dressing up or over-priced garage parking required. You can dress up if you want to, but most people come in their everyday attire and bring a picnic dinner to enjoy before or during the Symphony. Third reason I'm thankful? While the ISO performs during the first half of the series each Summer, they contract outside bands and groups to perform several weekends each season. That gives us a variety of entertainment. When Kurt or I volunteer, we earn free tickets for another SOP concert, so we can enjoy a concert with our girls or friends. We have heard several great groups in the past couple years. We have heard the ISO perform Rachmaninoff, Vivaldi, Gershwin, and Tchaikovsky as well as more modern tunes like John Williams' movie music, and the music of Queen. Other great performances we have seen at SOP include Classical Mystery Tour (Beatles tribute,) Big Bad Voodoo Daddy, and the River City Brass Band. Later this Summer we are all looking forward to hearing the Glenn Miller Orchestra and the Preservation Hall Jazz Band. While this may already seem enough reasons to be thankful, here's one more. The view behind the Symphony bandstand at sunset. Because this is an outdoor venue, there is no need to stay in your seat. You can feel free to leave your lawn chair for a while and go enjoy the sunset, or even venture down in front of the Symphony bandshell, where you will often find the dance floor set up for Jazz group performances. The girls know several people who like to Swing dance during the concerts. Whether I'm working, or just attending as a patron, Symphony on the Prairie gives me many reasons to be thankful! It also gives me hours of time to simply relax and enjoy the music! Why not join us and enjoy the music? You can click here to see the rest of this season's concerts. For the past 10 years, Emily has been asking (on and off) about taking piano lessons. It has never been in our budget to set aside the time and money required for enough lessons to feel like we were actually offering her something worthwhile, so we never began. I taught Emily what little I remembered from school (which wasn't much,) and then Emily would sit down at our second-hand organ and pick out the melodies to songs she had heard. So imagine my utter delight when the opportunity came along to join in on a review of HomeSchoolPiano with the Crew!!! I knew that if we were selected, Emily was sure to learn more than I could teach her, but I have been blown away by just how much this program offers! This review is going to be a little longer than most, but I hope you'll set aside the time because this could be the answer you've been looking for! It has truly been a blessing to our family. To start with, let's back up a little with some details. Emily is now 16, that means she has wanted piano lessons since age 6. In our area, most beginner piano lessons run $12-$15 for a half-hour lesson. We'll just use the $15/half-hour lesson for the math, because I have looked up some near-by teachers who charge $20/half-hour. At $15 a lesson, if Emily were to take weekly lessons for 40 weeks out of each year, that would equal $600! While I know many families set aside that money easily, some of us just don't have that luxury. We value music in our home, but there is always a breaking point in each family's budget between wants and needs . . . and piano lessons always fell into the want category, so Emily never had them. Now please don't misunderstand me, I know there are wonderful piano teachers out there who deserve ever penny you pay for their great lessons, I just want you to see the other side of things. The side where you tell your children "no" or "not now" and they grow up a little and realize that their life may not be just like everybody else's and that's OK. Enter HomeSchoolPiano. 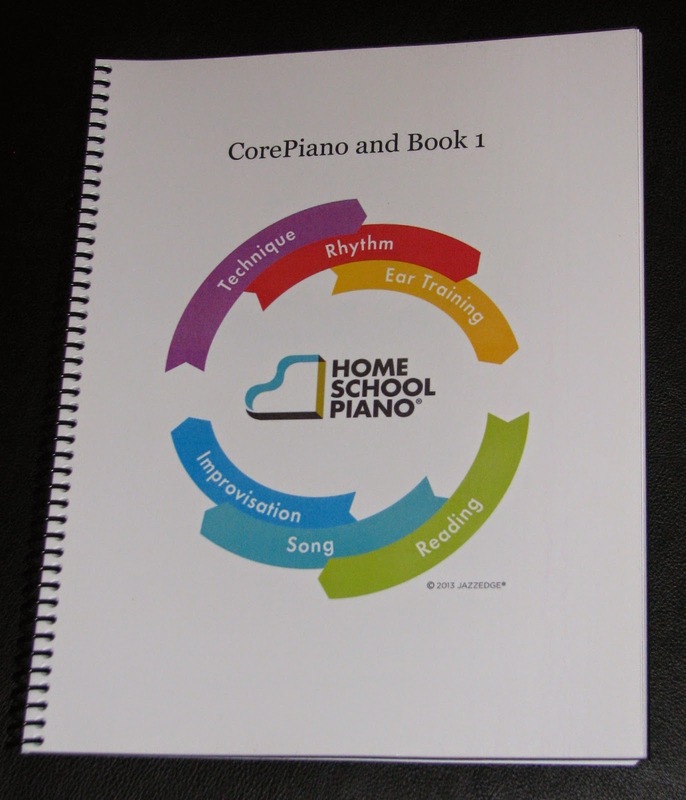 The lessons in HomeSchool Piano (which I will refer to as HSP) cover three levels of six units each (each level is called a book) plus over 30 lessons in the CorePiano section that teaches the basics of piano for beginners with no experience. For the Review we received a Lifetime Subscription to HomeSchoolPiano - Complete set of Books. When you include the bonus lessons, you get over 140 lessons in the Success Package for a total price of $299! NO, really, it's only $299! (If you want to make 3 monthly payments of $99.97 it would equal $299.91.) If Emily took private lessons, she would get only 20 lessons for the same cost. Here is the first part I found fascinating about HSP . . . your $299 purchases a lifetime subscription for up to five (5!) students in your family. That means I can learn the piano at my own speed, while Emily learns at her speed, and we can watch the lessons over and over again as many times as we want or need to. The program keeps track of each student's progress individually, and lets the parent login to see how far their students are (and if they took the recommended quizzes!) I understand that nothing truly replaces a personal teacher sitting beside you while you are improving your advanced techniques, but this program opens up the door for a lot of students to begin lessons and learn a whole lot more than most students ever accomplish. Once these three book levels are mastered, any additional lessons you provide for your students will take them to a level of mastery many piano students never reach. Since we were blessed to be able to join in the review, Kurt and I decided to invest a little bit and purchase a new keyboard for Emily and I to play on. 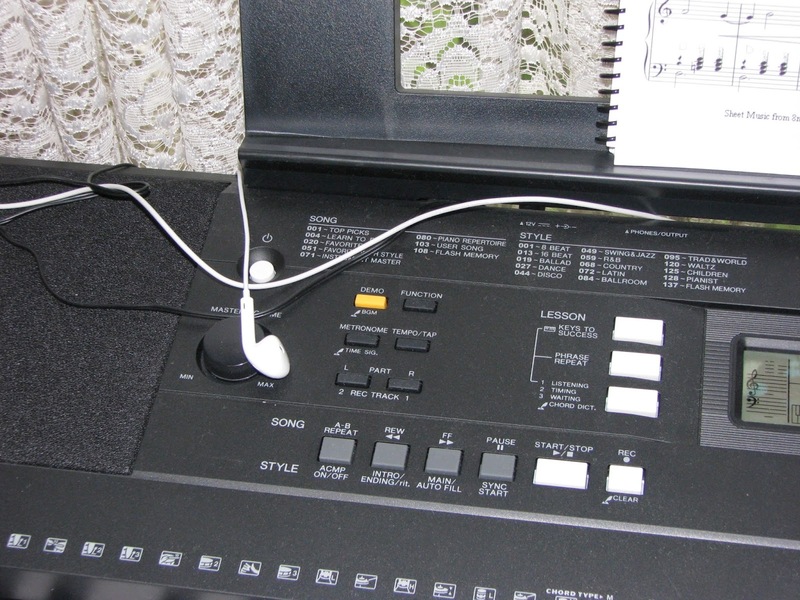 We purchased a Yamaha with 61 weighted keys, a power plug, and a warranty for about $225. This has been a great keyboard for us. If you look at the HSP website, you'll see that you need a minimum of 49 full-sized keys, a stand and a bench for your student to sit on. Luckily we already had the bench and stand! 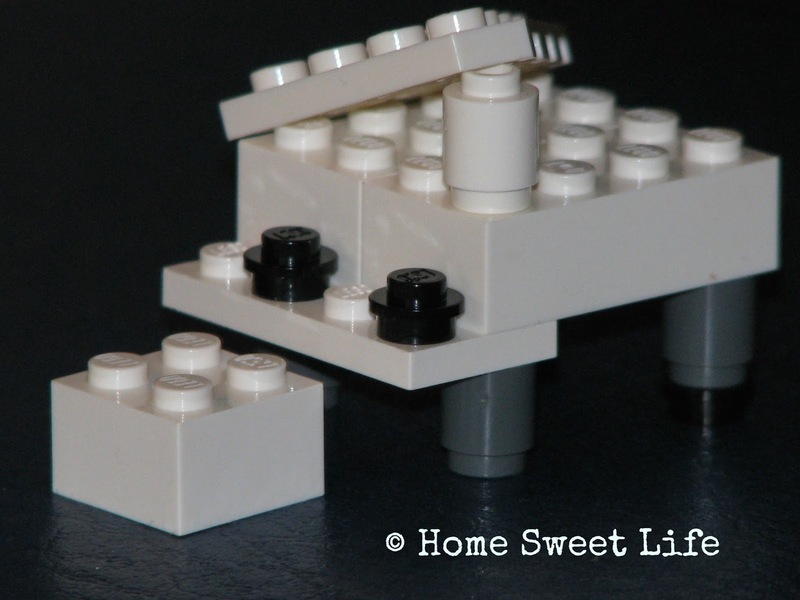 Willie Myette is your piano teacher on HSP. Willie is dedicated to teaching students to play the piano and have fun while doing it. Willie graduated from the Berklee College of Music and has toured both the US and Europe. More importantly, he has been teaching piano to kids since 1996. Willie teaches in the Jazz style, which may make you wonder 'what about Classical?' I'll let you know that everything I have seen so far in this program can easily be adapted to playing Classical Music. I think the Jazz side makes the individual lessons more fun. Emily has loved listening to Classical Music for years, I think her four current favorite composers are Gershwin, Debussy, Chopin and Tchaikovsky . 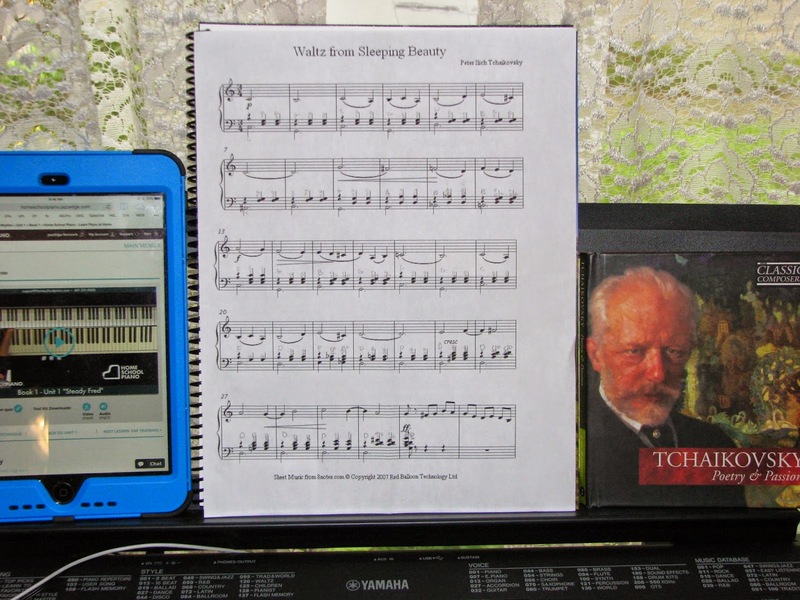 Emily is still in the beginner level lessons, but she is applying what she is learning in HomeSchoolPiano to teach herself to play a simple arrangement of Tchaikovsky's "Waltz from Sleeping Beauty." Most students in CorePiano and Book 1 will probably just stick with the songs Willie teaches in the lessons, but Emily is interspersing her practice for HSP with parts of the waltz. Thankfully she knows how to waltz (thank you very much Conner Prairie!) so she can understand the 3/4 time signature. By now you may be wondering how I am doing with the piano lessons . . . not bad considering my limited amount of time. I am learning a lot in the CorePiano lessons that I either never learned, or have forgotten since Middle School! For CorePiano and each of the 3 book levels, there are accompanying PDF files that you can download (and I suggest you print them too!) Willie refers to these pages as he goes about teaching the lessons. We had our local print shop print CorePiano and Book 1 and spiral bind them together. When Emily is almost ready to move to Book 2, we'll have them print books 2 & 3 and spiral bind them together as well. While you are watching a lesson, you will see Willie, an overhead shot of his keyboard, and above that, his virtual keyboard which highlights all the notes he plays and tells you which notes they are (C, D, G, etc.) I love this self-pacing of the program. Some lessons take longer to learn, while some are easier. Sometimes you might be able to learn two or three lessons' worth of material each week, other times you might need two weeks for one lesson. One point Willie makes in his blog (which you can read from the website,) is that younger students really need a parent to sit down with/near them while they practice. Practicing can be a lonely endeavor. Willie encourages his students to practice a minimum of 5 minutes a day, but 20-30 minutes day is much better. The reality is that you won't improve without practice. One of the great features is that you can view your lessons on any internet-enabled device. We prefer the iPad because we can watch the lesson and see the sheet music/ practice pages while setting at the keyboard. Once you've mastered the CorePiano lessons, you move on to Book 1. Here is where HomeSchoolPiano's lessons really shine. Each book is divided into 6 Units, each unit is divided into 6 lessons which focus on the 6 parts of learning to play Jazz. Technique teaches your student proper techniques for holding their hands and playing the keys. This part of each unit builds strength and dexterity in the student's hands in small chunks of time without overworking them. Willie stresses the fun in these lessons. He encourages the student to do the prescribed exercises first in each practice time, and then to feel free to move around on the keyboard to another octave, or do the exercises backwards for variety while still building dexterity and strength. The Rhythm section stresses the importance of playing the parts of your song correctly so that it sounds right. You are going to want to make sure you have printed out the pages that correspond with the Rhythm lessons so your student can work alongside Willie. In Books 1 and 2 Willie uses a vocalization method to teach rhythm. I found this helpful, and I'm sure your youngest students will too. HSP is geared for ages 6 and up, but could be used for younger students with enough parental help. Reminder- you can review these lessons as many times as necessary to make sure you master the rhythm being taught. This section also comes with an optional quiz. I optioned not to take the quizzes right now, but I'm going to make sure Emily takes them so we can really assess how much she is learning in each unit. Books 1 and 2 use 4/4 time signatures, and Book 3 moves on to other time signatures as the student becomes more advanced. The camera angle shows Willie at his keyboard, with you at his right, as if you're sharing a large bench and playing together. This gives an 'in-person' quality to an online program. Just in case you're wondering - you CAN download the individual lessons to watch. This would be particularly helpful if you have a slower internet connection. The Ear Training sections help you distinguish what you are listening to. 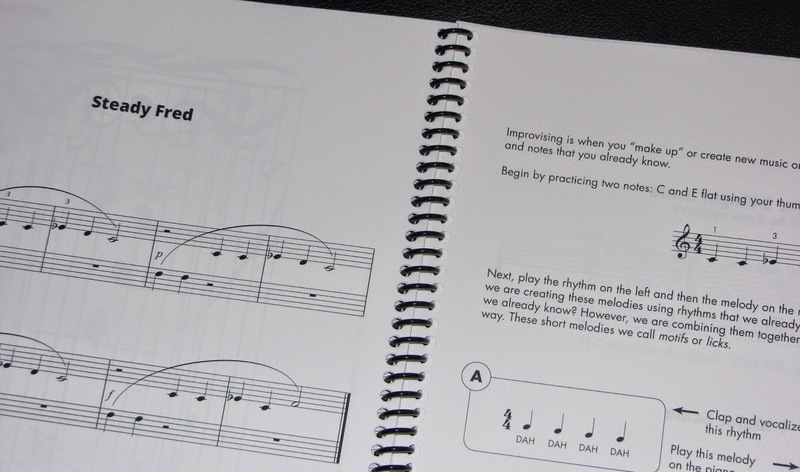 Book 1 focuses on melodic ear training and rhythm ear training. (I haven't gotten far enough to know what book 2 covers.) This section also includes a quiz. Willie helps the student learn how to listen and then look at different printed examples of music to help them figure out which one they are listening to. This will come in handy as the student progresses, AND for music appreciation. The Reading Music lesson in each Unit takes each part of the song that will be learned and breaks it down to its most basic parts. Each term is learned or reviewed (with frequent reminders to go back to the CorePiano lessons if you need/want more review) and each measure of music is taught one by one. Willie does an excellent job of explaining all the 'other' things besides just the notes on the page. Reading music includes being able to understand the differences between playing 'piano' or 'forte' and 'ties' or 'slurs.' This lesson also has a quiz, and I think you should check to make sure your students understand it well before moving on. The fifth part of each unit is a lesson on actually playing the song, from beginning to end. Here is where Willie shows the student HOW all of the parts they have been learning (technique, rhythm, and reading) fit together to make playing the song easier. Willie gently shows the student all of the parts and techniques they have learned and how they combine into the finished song. Then he encourages them to play it in different ways, possibly adding in a drum track or changing instruments if they are using a keyboard. The Improvisation lesson makes this program totally unique from other piano lessons. In this lesson the student learns how to incorporate their own personal expression into the music they have been learning in the unit. They learn how improvising is not making something out of nothing, but rather combining parts they already know in a unique way. Playing along with the video gives a 'Duet' atmosphere with Willie adding the accompaniment to your playing. With the flexibility of this online program you can practice and play your duet at any time of the day or night. Ever heard of a piano teacher for people who work weird hours? Know anyone else who will accompany you at 2 a.m.? Me either. That flexibility in lesson time also makes a keyboard with headphones a wonderful option for the rest of the family! I really appreciate the flexibility to learn at your own pace. It has been great for me these past few weeks when my time to play each week has varied widely due to work and the girls' 4-H judging schedules. This really is one-on-one instruction. It also gives older students the ability to work at their own pace, which may be faster than your average beginner student, but still seems slow to them. We also have Arlene registered on our account at HSP, but because of her 4-H projects, she hasn't really had a lot of time to watch the videos. That's ok, I'll plan time into her school schedule for this fall. She can learn at her own pace. Before I wrap this up, I want to spend a minute or two telling you about the student records part of HSP. When I login, I can view how far any of us have gotten in our lessons . . . and who took their quizzes. The program tracks each student individually and always reminds them where they left off, giving them the option to watch that lesson again, or move on to the next lesson. Technically, you could skip ahead, but I wouldn't recommend it. CorePiano shows when each lesson was started and finished, and the Books' reports also show if the quiz was taken and what the score was (you can take each quiz up to 3 times, and you need at least a 60% to pass.) The bar below shows I still need to finish this Improv lesson! Each video lesson is somewhere between 5 and 15 minutes, usually the technique ones are shorter, and the music reading and improve videos are longer. Unless your student has played for many years, I would suggest they watch the CorePiano lessons, even if they don't need need to practice these ones. Older students who are brushing off the dust could watch all of the CorePiano lessons in a day or two, beginners need to watch them one or two a day max and practice each part. 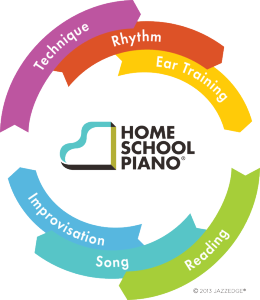 Overall, I cannot express how impressed I am with this program from HomeSchoolPiano! I would consider it a great value if only CorePiano and Book 1 were included at the $299 price. When you consider all 3 books, it becomes an outstanding value! I think many families who are wavering on whether or not to get piano lessons for their children would benefit from this program. With the ability to have up to five students per subscription, you could learn a lot about your students' musical stick-to-itiveness without breaking the budget. For those of your children who stay focused and compete the program, private face-to-face lessons will be a quality investment, not just a 'we'll see if they like it' option. You cannot learn to play the piano without instruction - unless maybe you're the next Mozart. 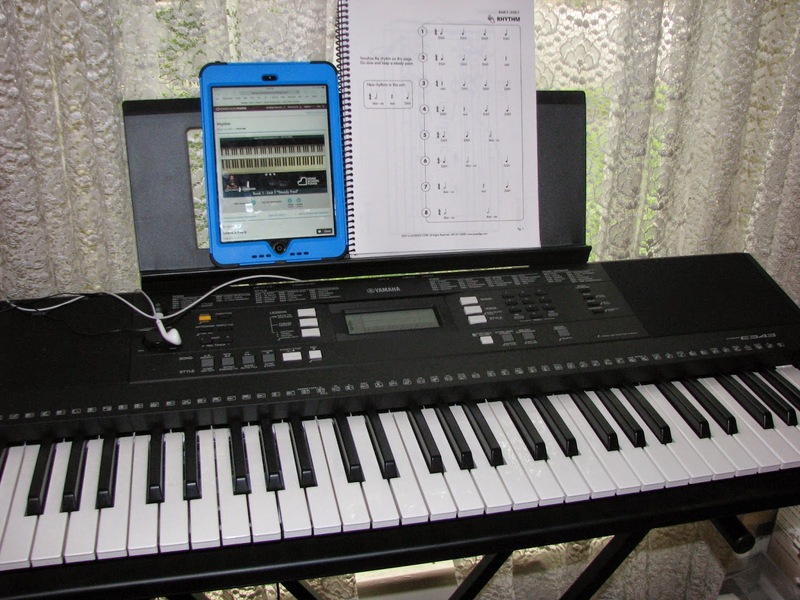 For the rest of us, HomeSchoolPiano is a wonderful option to learn to play the piano! If you're still not convinced, you can sign up to watch a free sample lesson. 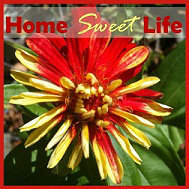 Consider following HomeSchoolPiano on Facebook! 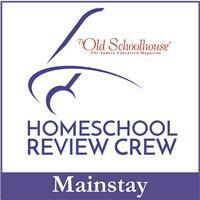 There were 90 Crew families reviewing HomeSchoolPiano, click the banner below to read some of the other reviews. Thankful Thursdays - 7/17/2014 - Creative Teens! So what did the girls do that they wanted pictures of? 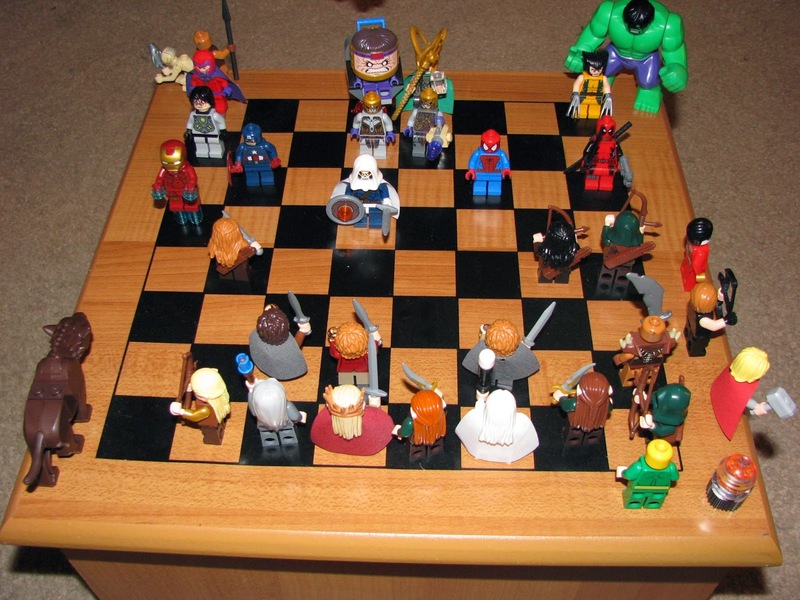 They played chess . . . 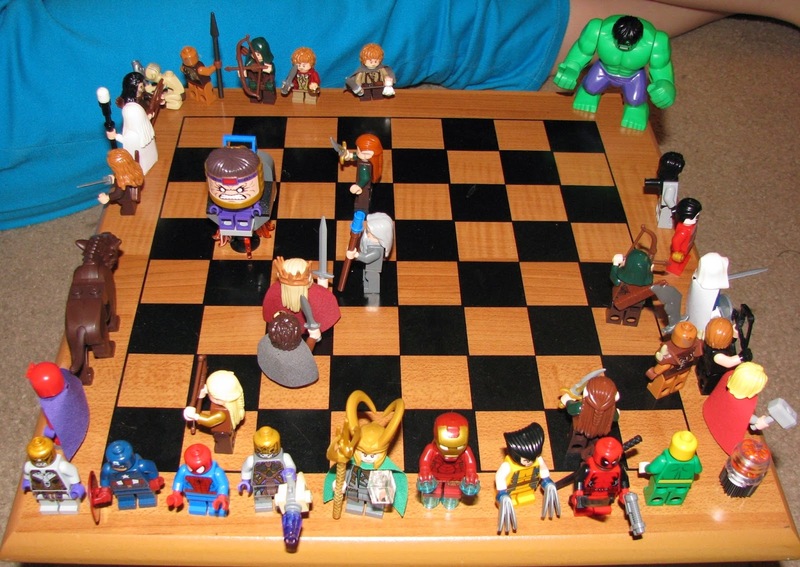 I know, that's a little unusual for girls these days anyway, but HOW they played chess was the blog-photo-worthy part! Emily collects superhero Lego, Arlene collects Lord of the Rings Lego. You guessed it, it was a battle of EPIC proportions! Take a look. . . In case you're wondering. 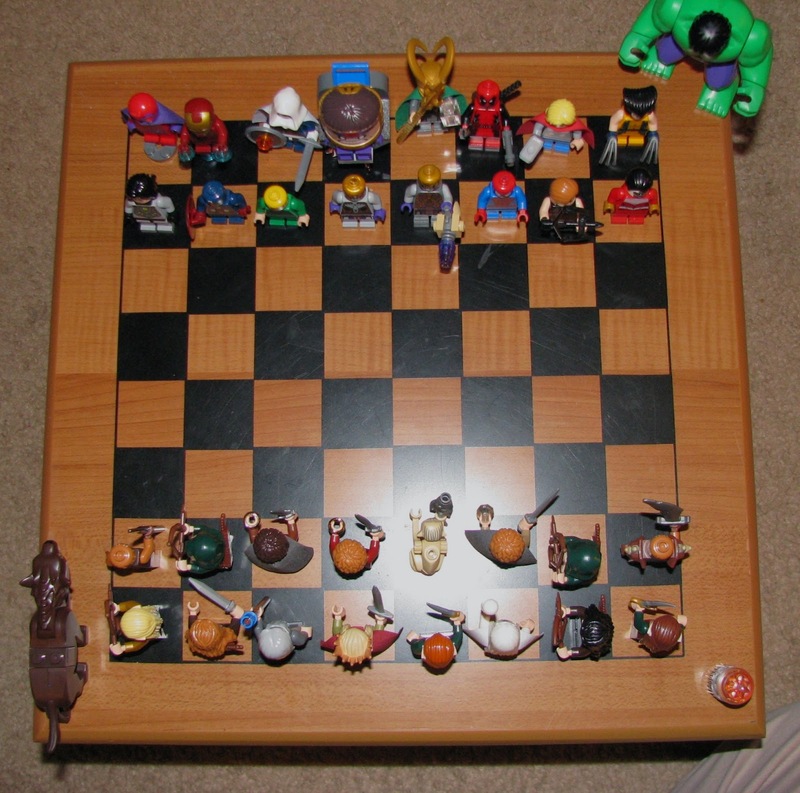 . . yes, they DID make a cheat sheet to help them member who represents which chess piece. Here's the Bird's-eye view. Notice the fallen men . . . they don't get to watch, I guess that's the punishment for getting captured! If you take a good look now, I'm certain you can figure out who won. 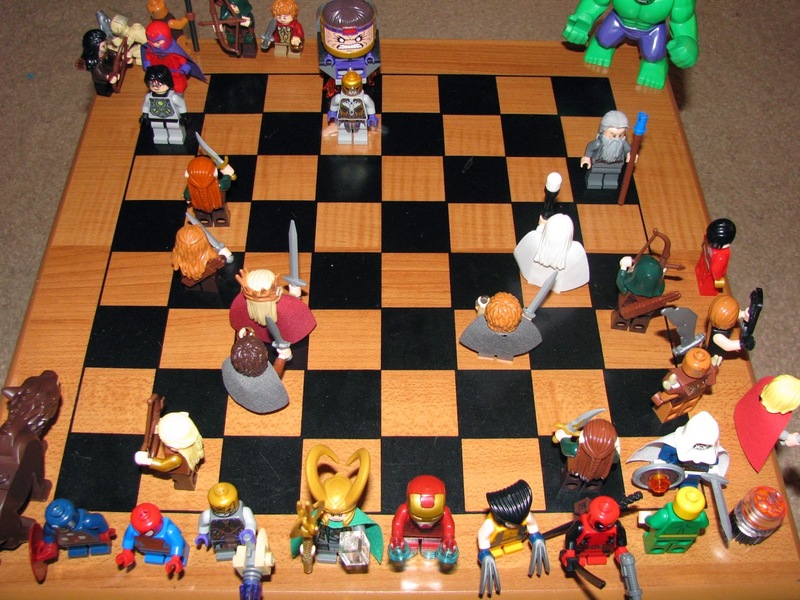 More important than that though is this - the girls have played chess this way more than once this week. I think it's their new favorite way . . . since I saw them playing it this morning while waiting their turns at 4-H judging! So what am I thankful for? Daughters who still have (& use) their creativity! I am thankful for girls who aren't afraid to be different from the crowd, yet who don't disparage others for being a little more conventional. I'm thankful our girls taught themselves chess, and that they still enjoy spending time together! Hope you're thankful for your children too! I think sometimes Moms are afraid to relax. We can get this mistaken idea that if we let our guard down and relax the whole world will come crumbling down. Have we forgotten that it is GOD who holds the universe together? 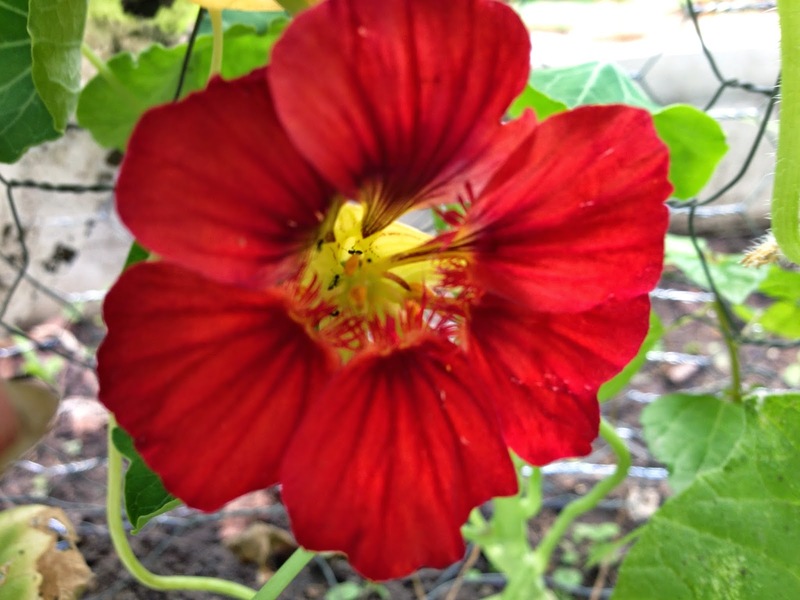 My favorite edible flowers are Nasturtiums. You can eat the leaves or the flowers, but I prefer the flowers. 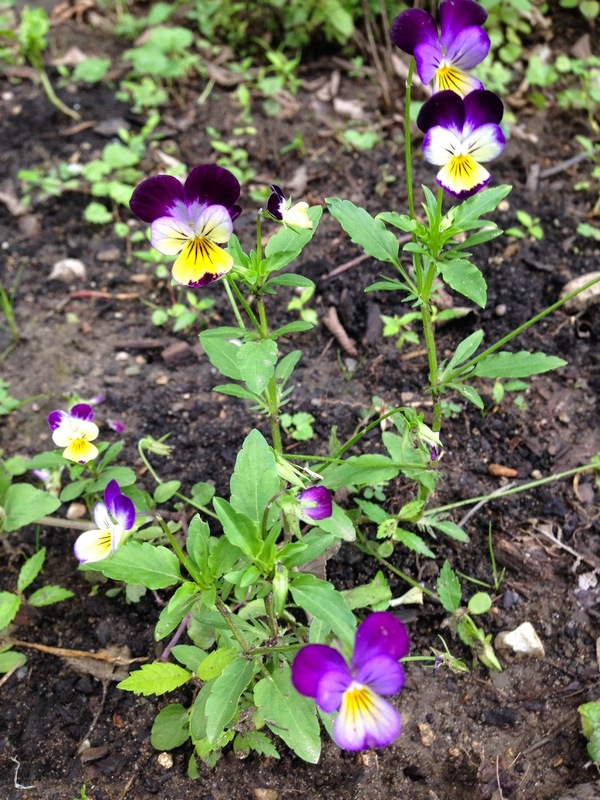 My second favorite are probably Violas (usually called Johnny-Jump-Ups.) Nasturtiums are a little bit peppery flavored- but not black pepper or bell pepper. . . something in the middle - you should just try them yourselves, they're super easy to grow! Violas don't have a strong taste,but they look SO pretty on top of a salad. If you're wondering, yes, Violas are related to violets, and pansies, both also edible. You could click here to learn a smudge more about edible flowers. You could also read our review of a helpful book here. I love sunshine, blue skies and colorful flowers, but when I'm feeling overwhelmed I like to take a quiet walk in the forest. 4-H teaches kids deadlines, and learning to accept the opinions of others with grace. These are both things I think we can ALL work to improve upon. My husband Kurt is a pretty cool guy. . . he puts up with me, even when I'm a little crazier than usual. That's something to be thankful for! 20 years and counting! Our yard should probably get mowed tomorrow, but I'm more likely to go to the Farmer's Market instead. Maybe it will stay cool long enough to do both, if not, sorry. . . you can look for the bunny eating in the front yard when you drive past this weekend! We are doing a few really awesome reviews right now. I really think you'll enjoy reading about them later this month. I am especially impressed with the lessons from Home School Piano. If you're antsy waiting for the review, you can click over now & watch the sample lesson. I think I should have gotten Arlene another pair of shorts for this summer, but, since she's done such a great job sewing her 4-H outfit, maybe she can just make some herself. Hmm. . .
We do not live in a perfect world, and I do not live in a perfect house, yet I'm thankful the 4-H projects are done & we can see some of our floor again! I'll post some pictures later this month. Life is short, love your spouse, hug your kids, and clean the sink once in a while ok?! First up, Lisa from Farm Fresh Adventures. I've only known Lisa for about 7 months, but it seems a lot longer. We had the pleasure of meeting up at the Cincinnati GHC convention in April, and found out that Lisa grew up with my cousin's wife, Katherine. I think that, and the fact that she's a farm girl, likes the outdoors, and good food, put us in a lot of the same thought circles. Lisa has a couple cute little boys, so she's often reviewing curriculum that we don't since our girls are on the older end of the spectrum. If Lisa lived closer, I'd probably pack us all in the car and head over for an afternoon on the farm. Next up is Dawn from Guiding Light Homeschool. Dawn makes me laugh as she shares from her heart about what works, and what doesn't, with their two boys (one High School, and one early elementary.) Dawn tends to get straight to the point in her writing (unlike myself,) and she isn't afraid to try something new. Dawn also does a lot of link-ups where a lot of bloggers all write on the same theme for the day. That gives me all kinds of random fun things to read. Last for today is Laura at Day By Day in Our World. I've never actually met Laura in real life, just online . . . because she lives in ALASKA! How cool is that? Laura blogs about all sorts of things that she is doing with their 4 boys, AND she loves to share recipes! Laura reviews a lot of things besides just curriculum, and often has great suggestions for your home or kitchen. Laura is one of the bigger bloggers that I read, because she is still very real and personal in her writing. Come back next week, maybe you'll meet some more of my Bloggy friends, or I'll have more coherent thought to share. Until then, remember you can sign up to follow us by email on the top right side of the page, or visit us on Facebook. Now, what should I put on my list for the Farmer's Market . . . ? 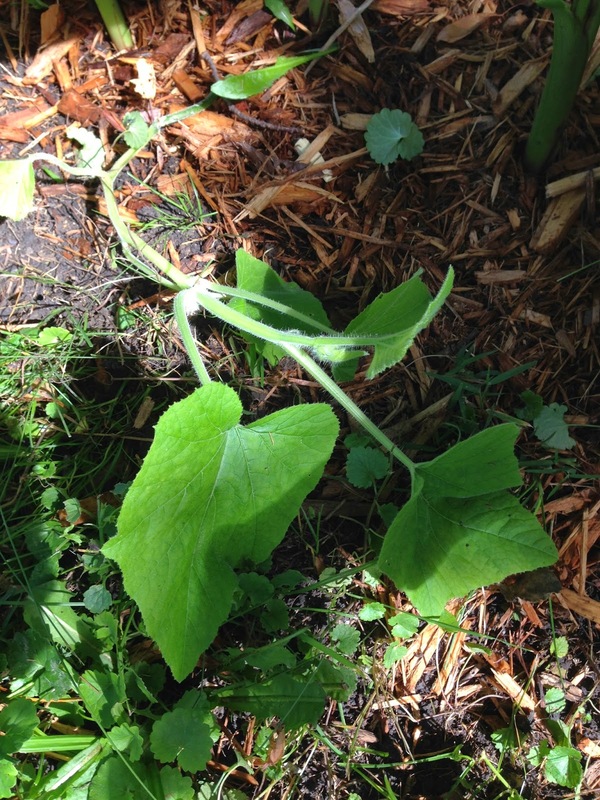 Last year I tried unsuccessfully to grow zucchini. A couple years before I grew a couple small zucchini, but the critters in the yard got to them before I could make zucchini bread. So last year I made a new bed & tried to grow two different kinds of zucchini. Nothing. Most of the seeds didn't even germinate. I was disappointed. We opted for the next best thing. The Farmer's Market. 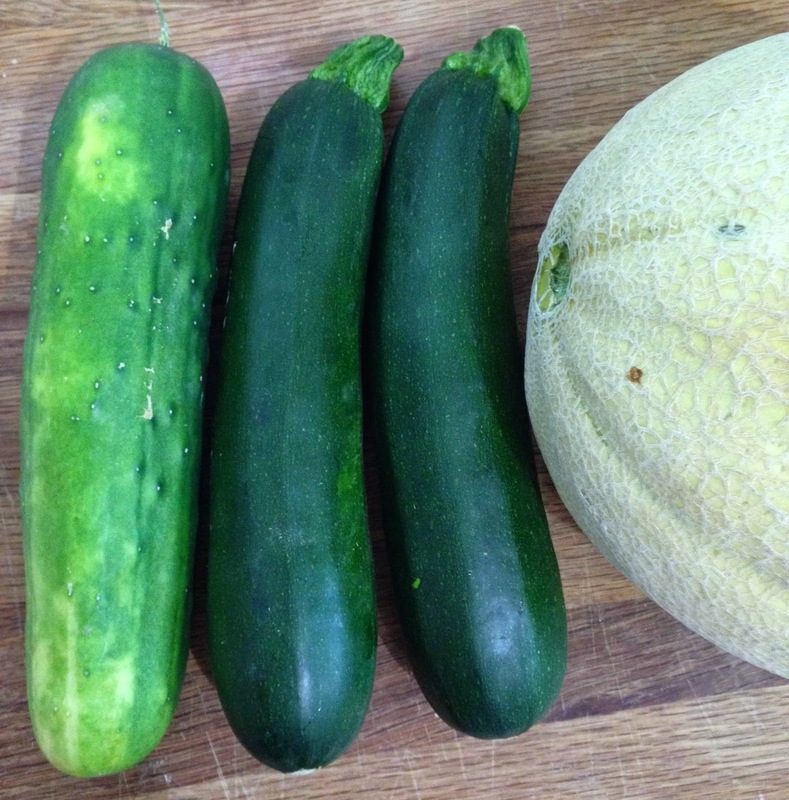 The local Farmer's Market usually has a plethora of zucchini growers, so prices stay quite competitive. I mean LOOK at these beauties we bought this morning for only $0.50 each! After we got home, and stowed all our produce, I went out to water the gardens. In case you're wondering, we planted Canna bulbs from our neighbor in the small bed that was supposed to have zucchini last year. They're almost to the height where they'll start flowering. I decided since the weather was still beautiful, and the garden was watered . 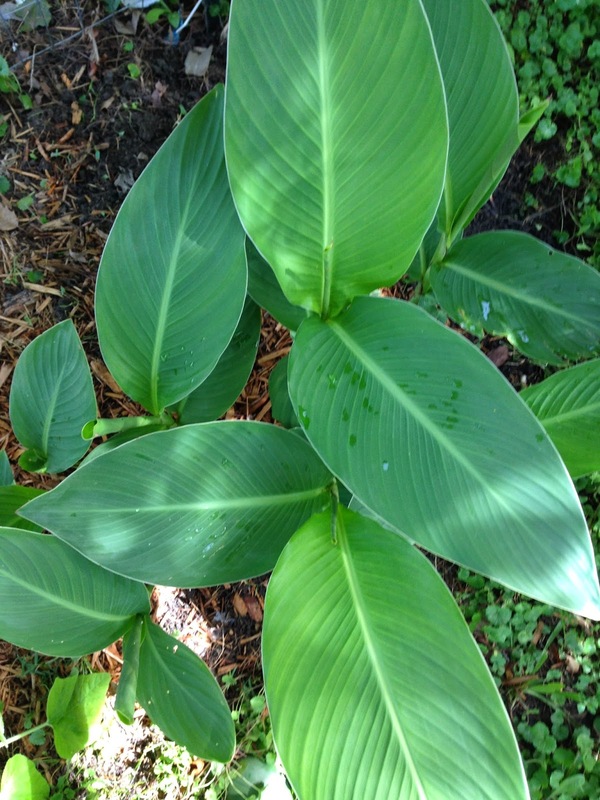 . . and the girls were inside cleaning the bathrooms, I would go ahead and weed the bed around the Cannas so it would look nicer when they bloom. Imagine my surprise to find THREE zucchini plants growing happily amongst the Cannas. It looks like two of one variety and one of the other. How did these three seeds manage to go all year and NOT germinate, just to start growing AFTER the Cannas came up? I guess God has a funny sense of humor when it comes to my gardening! A lot of our friends go out for "Date Night" about once a month. That rarely ever happens with us, try maybe twice a year. Part of the reason is because Kurt's schedule changes every week. . . that doesn't exactly lend itself to planning ahead. My schedule changes a lot too, so what we do instead is usually a lunch date, or a movie from Netflix without the girls. I'd like to tell you about a recent lunch date I was thankful for, and how it all came about. 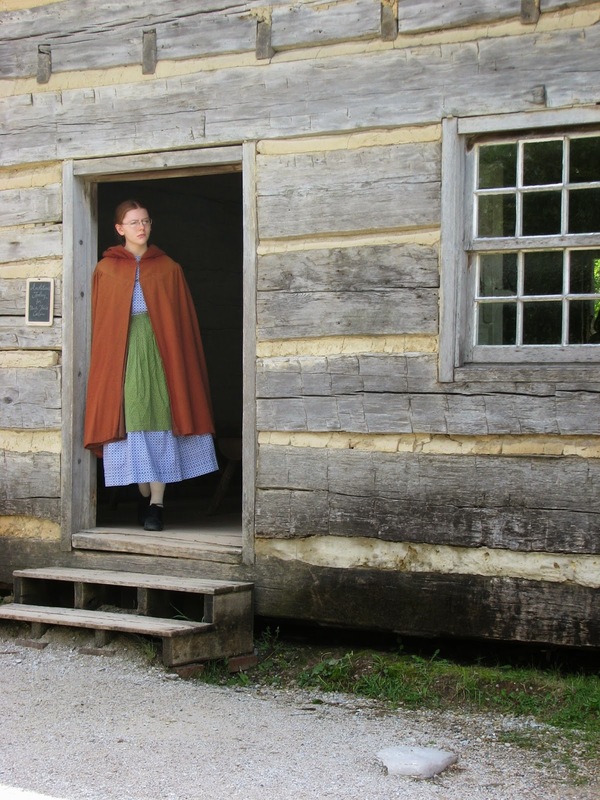 Our girls both volunteer at Conner Prairie (a living history museum,) and part of their job is to turn in their requested days to be scheduled a month in advance. Thus, by May 1st, you have to have turned in your June schedule. . . see how this can be difficult to coordinate with Kurt's ever changing schedule??? So one time last month, the girls were both scheduled to work all day on a Friday, when Kurt had the day off. Then, I had a brilliant plan, what if, instead of packing our OWN lunches . . . we just headed to Chik-fil-A?! Yeah, Kurt was thankful for that idea too! 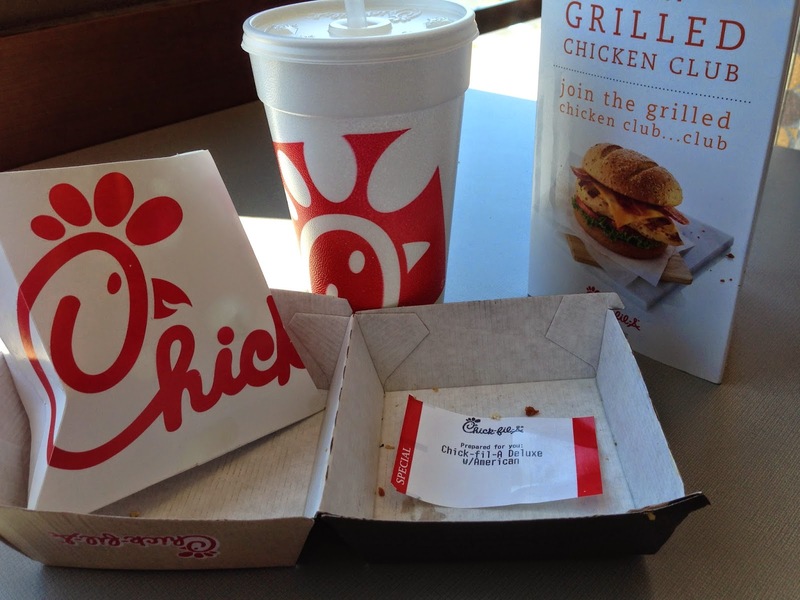 Just in case you somehow don't know what Chick-fil-A is, it's a restaurant, an almost-fast-food-but yummier place, that serves. . . chicken! So after dropping the girls off and running several errands, we went for lunch. I would show you how delicious my sandwich looked, but, alas, I was too hungry to snap a picture before I dug in! So, here is the evidence of my wonderful lunch. 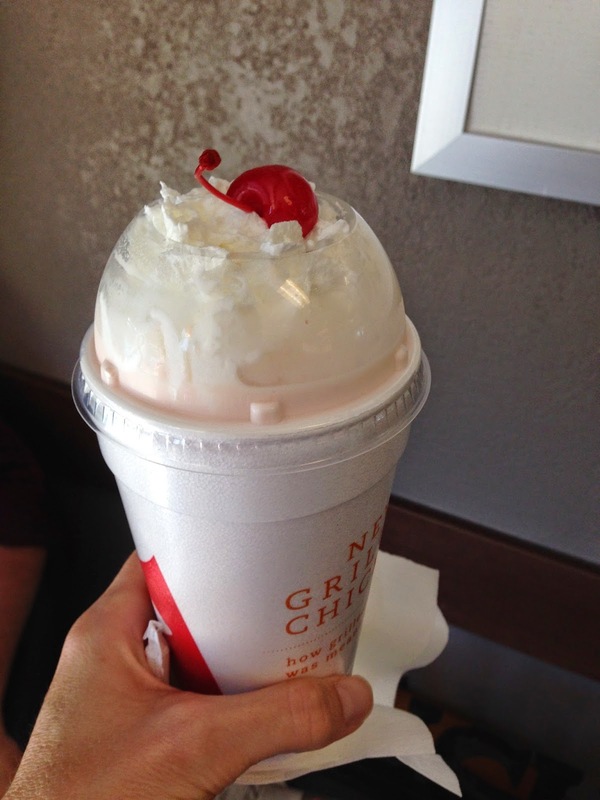 Then, just to be EXTRA thankful, we shared a strawberry milkshake. Extra yum! A lunch date for under $20, and some time with my husband, great reasons to be thankful! Yesterday, I told you a little bit about Diana Waring, the author of the Experience History Through Music books and CDs. If you somehow missed that, you can click here to read it. You can also read more about Diana and all of the great books she has written on her website: Diana Waring Presents! Today, I want to share with you our review of each of the three books available in the series. Our family has been a fan of these books for a long time. Even though they just released, we have owned copies of the original books (& accompanying cassette tapes) for over a decade. Besides telling you about these wonderful books, and the catchy Folk Tale tunes on the CD's, I'll include a little bit about improvements between the original books and these new releases. The picture below show our originals and the new releases! Yea for no more cassette tapes! There are three books (w/ accompanying CD's) in this series. Westward Ho: The Heart of the Old West, Musical Memories of Laura Ingalls Wilder, and America: The Heart of a New Nation. 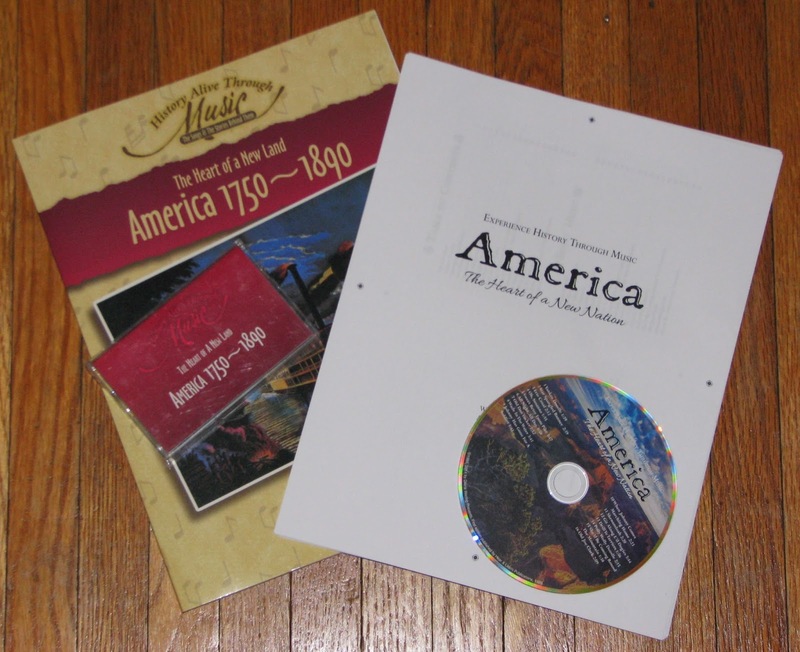 For the period of this review (about a month) we received all three CD's, the printed Books of Westward Ho and Laura Ingalls Wilder, and a PDF of the America book (because it was at the printers!) Each individual book retails for $18.99, but for the month of July, 2014, you can purchase a bundle with all 3 books & CDs for only $50. Whether you love a good Folk Song, love the history behind songs, love history in general, or just want something unique for your family to listen to, I'm certain you will enjoy any of these books. 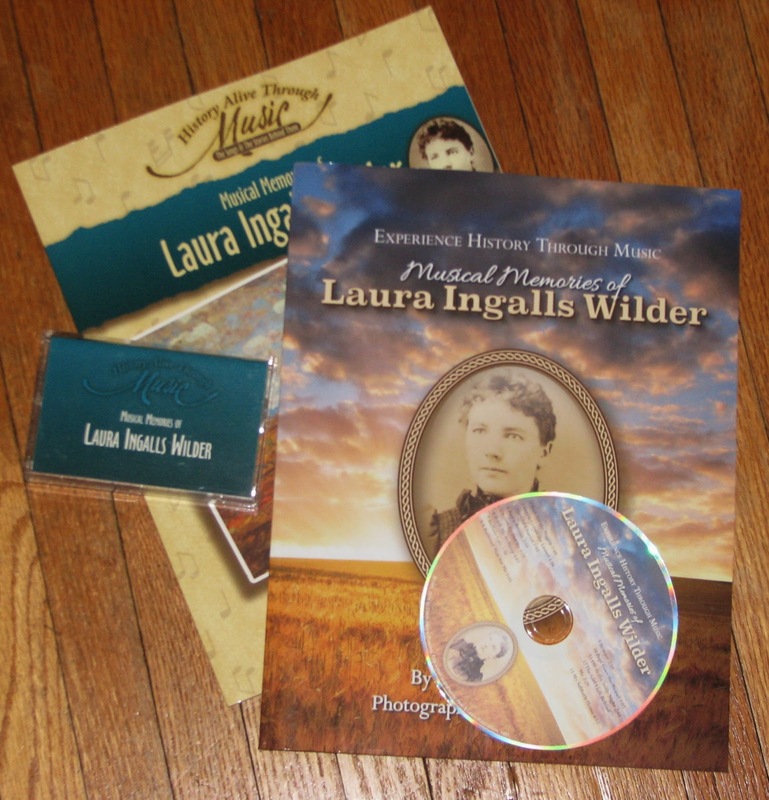 As I'm writing, we are listening to the CD from Musical Memories of Laura Ingalls Wilder. Let's just start with this book shall we? Many, many of us and our children have read at least one of two (or all) of Laura Ingalls Wilder's books. This book contains stories of the Ingalls family, photos of Laura and her family, drawings of Laura, photos of the historic sites where Laura lived, and photos of re-enactors from the DeSmet annual Laura Ingalls Wilder pageant. This book includes 13 songs (AND sheet music of the melody- which is all you really need for Folk Songs right?!) Many of the songs will be familiar to you like: Buffalo Gals, Sweet By and By, and Pop! Goes the Weasel. The joy of this book coming with a CD is hearing the songs you've always wondered about from Laura's books, like : Green Grows the Laurel and My Sabbath Home. For Little House fans, this book and CD set is a real treasure to increase your love and understanding of the life and music of the Ingalls family. For the rest of you. . . how can you NOT like the Little House books? You'll love the variety of music from a simpler, but harder time. Laura Ingalls Wilder lived during years of hard work, long winters, and glorious summer days. Step back in time with us, give it a listen! "In the sweet by and by, we shall meet on that beautiful shore." 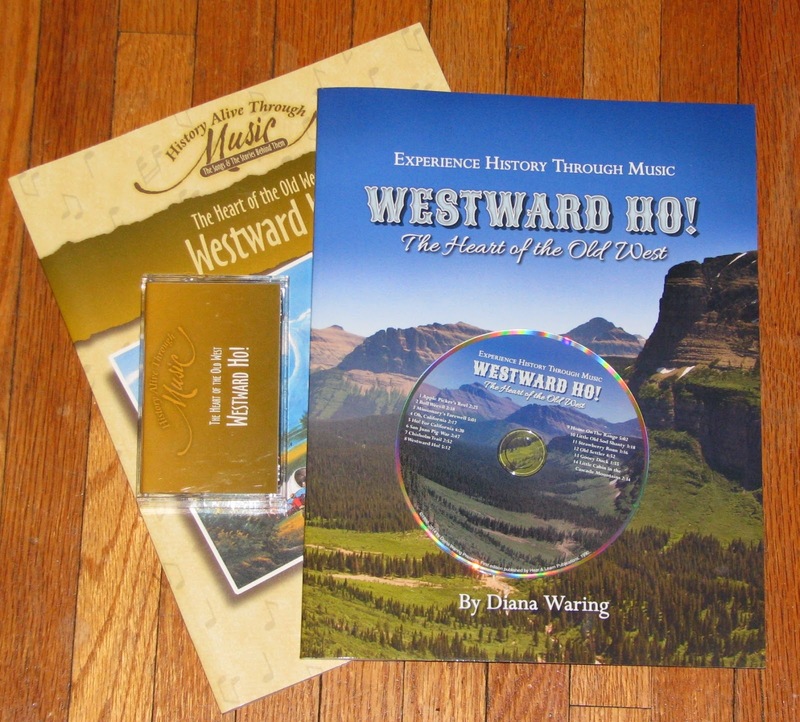 The book Westward Ho: The Heart of the Old West focuses on Folk Songs that talk of our country's expansion westward from about 1820 through the 1920's. We live in such a connected/ internet world that we sometimes forget about how disconnected from their former lives the settlers were as they moved West. We begin this book with The Apple Picker's Reel. I'm pretty sure this one of Emily's new favorite, since I've heard her singing or whistling it almost every day for the past two weeks. It's a catchy tune. One of the important things to us (since the girls are both period re-enactors,) is knowing WHEN each song was written. While this song talks about apples, and the story in the book talks about the expansion of apples to the west coast, the song was not written until 1966. Thus, it's just for singing at home, not while the girls are in costume. The next song in the book, however, Missionary's Farewell was sung at a wedding in 1836, so it would be fine for either Emily or Arlene to sing in costume since they re-enact 1836 and 1863. Arlene is looking forward to having more songs to sing in costume. 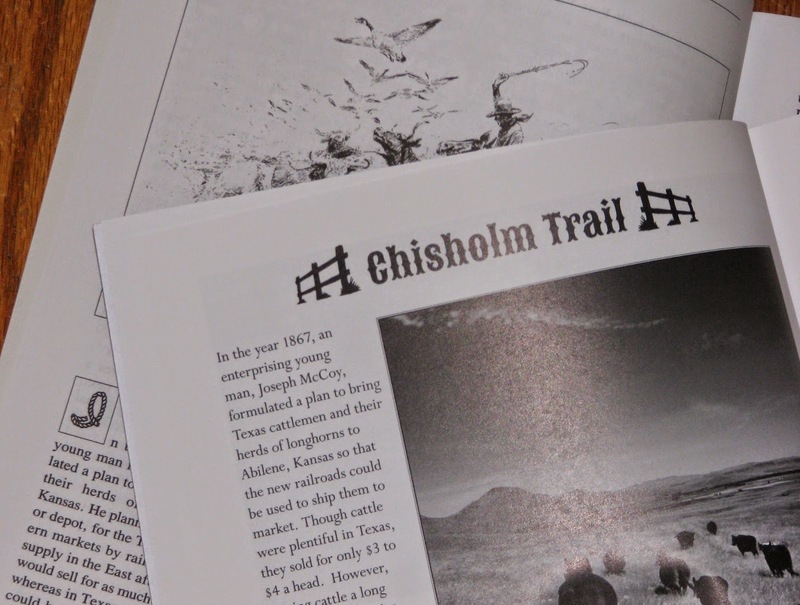 Also included in this book's 14 songs are ones you'll probably find familiar, like Home on the Range, and the Cowboy classics Chisolm Trail and Strawberry Roan. If you look at the Experience History Through Music page of Diana's website, you can see the complete song lists. The third book in the series, America: The Heart of a New Nation includes 16 songs, most of which you'll recognize and want to sing along with from the beginning. Selection include favorites: Yankee Doodle, Star-Spangled Banner, Old Dan Tucker, She'll Be Coming Around the Mountain, and my personal favorite: All Night, All Day. What you may not already know are the stories behind these songs. While many have heard about Francis Scott Key's writing of the words to the Star-Spangled Banner, do you know the story behind how Yankee Doodle was turned from an insult into a song of victory? You can learn history, and economics, by reading about the Erie Canal, then sing the song on your next family hike to warn those behind you of low-hanging tree branches! These songs cover a lot of American history, and you can pick out just a few to focus on a particular time period, or learn them all and have a great repertoire of American Folk Songs. I want to spend a minute comparing the older versions of these books with the new releases, just in case you already own the originals and wonder if you should purchase the new ones. The answer is YES! I mean, really, these have CDs!!! To listen to the old cassette tapes I have to go out to my vehicle (because it has the only tape player that still works!) Also, these stories have been re-written. The main information covered hasn't changed much, but Diana's writing style had improved over the years and these new releases read more as stories to tell around a campfire than as a report. Also, the new typeface is easier to read. 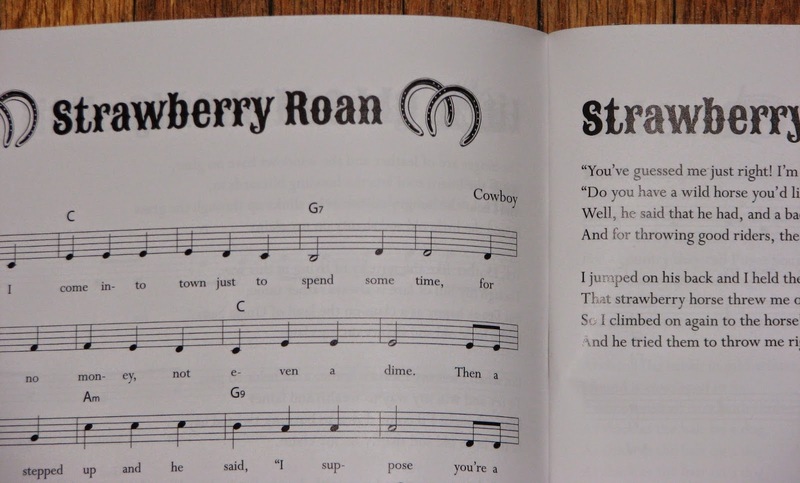 The HUGE improvement over the original books (other than CD vs. cassette) is the layout that places the additional verses across the layout from the sheet music, instead of on the back of the page. That way, the person playing the music isn't struggling with the rest of the family who want to move on to verse two! Overall, these books are a real gem for any music teacher, family, summer camp or after-school program. We highly recommend them! These songs are appropriate for all ages, and the sheet music is simple (even I can play them!) If you think you have a favorite already picked out, click on over and order it now. . .if you're not sure, read through the page and the song listings and consider the bundle package of all three books with their CDs. For those of you reading this on July 1, 2014, Diana is having a Facebook Release party tonight in co-operation with A Journey Through Learning. Join us for the fun from 8-10 p.m. EST tonight! You know we'll be there!